Erith (/ˈiːrɪθ/ ( listen)) is an area of south-east London, England, located 13.3 miles (21.4 km) east of Charing Cross. 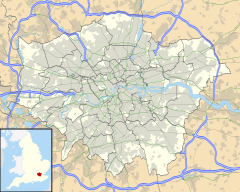 Historically part of Kent, it has formed part of the London Borough of Bexley since 1965. Erith is located to the north-east of Bexleyheath and north-west of Dartford, and lies on the south bank of the River Thames. This page was last edited on 13 March 2019, at 20:52 (UTC).